442, Lot: 528. Closing Apr 17, 2019 at 12:56:00 PM ET. Salonina. Augusta, AD 254-268. Antoninianus (22.5mm, 7.76 g, 1h). Piedfort or trial striking(?). 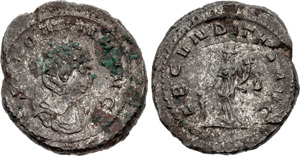 Rome mint, 4th officia. 9th issue, AD 265+.